The tour includes all the important places of interest in central & south Tibet. We have two full days in Lhasa which gives us ample time to see the most important sites and allows us to acclimatize to the altitude in the comforts of the Hotel in the old town, and then really enjoy the overland trip through the Himalaya. 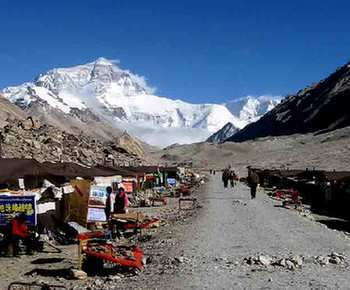 The breathtaking view of Qomolangma Peak at the Base Camp fascinating region, the devout pilgrims making their way to Lhasa will make our journey an life-time trip. Today we will ride to the Drepung and Sera monastery. About 8km west of central Lhasa is the Drepung, once world's largest monastery with about 10,000 monks. Walking up to the hill is a pleasant thing, an easy break from the solemn ambience inside the halls and chapels. At the plat roof of hillside, you can have very good views of the whole Lhasa city and the distant mountains. Sera Monastery sits at the foot of the mountains. One of the three main Gelupka monasteries in Lhasa, Sera is an important spiritual center for Buddhist monks. We will visit Sera Monastery in the afternoon, because if we are lucky enough, we could watch the Lamas in their traditional theological exercise of lively debating. Stay in the same. Your guide will pick you up from your hotel. This morning we visit the Potala Palace, a landmark of Lhasa and the political symbol of Tibet. You will join many pilgrims on your way to the top of a hill where this 13-storey architectural wonder stands. The approach to the Potala is not easy, and requires climbing many steep steps, so we take it slowly and allow ourselves to leisurely enjoy the Palace and its surroundings. We enjoy strolling through its winding corridors and peaking in some of its thousand rooms, and can only imagine what life here was once like. In the afternoon, we visit the Jokhang Temple, the spiritual center of Lhasa. As we make the inner circuit around the courtyard, spinning numerous prayer wheels as we go, we are swept up in the energy of the devout. From the rooftop, we get stunning views of the Potala, and the snow capped peaks off in the distance. Around the Temple runs the Barkhor, a holy circuit which pilgrims undertake and a bustling commercial market. Stay in the same. Although it's just 100km from Tingri to Mt. Everst Base Camp, it takes about 5 hours since the cracked winding roads demand much caution. But the views are stupendous on a clear day, and feature a huge sweep of the Himalaya range including peaks over 8000, Makalu, Lhotse, Everest, Gyachung and Cho Oyu. When you finally get to Everst Base Camp, the first sight of the mighty Everest simply leaves you speechless. All the hardship you bear along the way makes sense at this while. The best moments to watch Mt. Everest's are early morning and late evening when Everest is shining like a goddess in the sunglow. This afternoon is left free for you to wondering around the Rongphu Monastery or hiking to the base camp of Mt. Everest. Stay Overnight in the hostel near Rongphu Monastery. Drvie from Rongbu Monastery to Shigatse vs Tingri, about 9 hours on the way. Stay in Shigatse hotel or the similar. We will visit Tashilhunpo Monastery this morning. Built in 1447 and the seat of the Panchen Lama, the monastery houses a giant statue of the Maitreya Buddha and a tomb of the 4th Panchen Lama, which contains masses of jewels and gold. Just close Tashilhunpo is the Old Town of Shigatse, a great place to wander around: Nicely decorated Tibetan houses and interesting market and bazaar give you a vivid picture of local people's life. We drive back to Lhasa(about 5 hours) in the afternoon. At arrival, you could walk around the old town and do some shopping for old prayer wheels, tankas, etc.on your own. Over night in Shangbana Hotel or the similar. Transfer service to the airport for the flight out of Lhasa. The end of the tour.